It’s hard to imagine a world without technology when it has been such an integral part of our lives since the 1980s. Computers and cell phones have become the glue that holds families together, particularly when they are scattered around the world. It’s the lifeline to friends across long distances and well, let’s face it, even across the same room (Admit it. You’ve done that). In our most recent release, Roaming Pleasure, a Countermeasure Bit of Life, technology is front and center as Trevor and Cassandra experience their first time apart since they exchanged wedding vows. Even though they are separated by miles of ocean, they have comfort in knowing that they can text, talk, or see each other any given moment of the day, that they are just a simple keystroke away. What if you didn’t have the luxury of technology? Close your eyes. Imagine that you can’t access the internet and your cell phone has died. To some that would make no difference, to others it would sever a critical line of communication. That’s what happens to us each time our Wi-Fi goes down or cell phone powers off. Either way, if the technology we have today disappeared, the ease and spontaneity with which we now communicate with our families and friends wouldn’t exist. For Trevor and Cassandra, their separation would have taken a different turn. They wouldn’t have had instant messaging, video conferencing via computer, or phone calls at their fingertips. Their desire to stay connected with each other throughout the day would have been limited to an appointed time when they could contact each other through a landline. It would still have been special and they would probably have made it work their own unique way, but it wouldn’t have held the impact that the unexpected series of texts Cassandra received from Trevor had at that very moment when he needed to express them. As much as we may have become slaves to technology, its positive aspects still outweigh the negative. Technology has linked people from the farthest corners of the world, allowed for love to flourish between couples who wouldn’t have met otherwise. And allowed for writers to collaborate in their writing like Chris and me. Whether you embrace technology’s full potential or use just bits of it, it is here to stay and exciting times lie ahead. Who knows, maybe in the next ten years holographic projections will allow us to virtually visit with friends and family. Allow us to attend meetings across the world and maybe even allow us to be with those closest to our hearts when separated for short periods of time. Hmm… I think I just heard the wheels in Trevor’s head begin to turn. I can only imagine the future surprises that he may have in store for Cassandra and the rest of us. How about you? Do you use technology to stay in contact with family and friends? 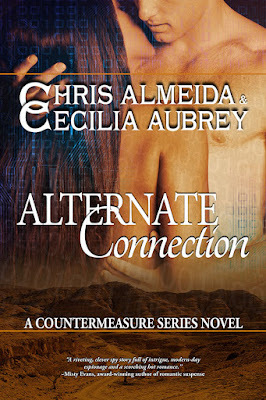 Don’t forget to check out the next novel in our romantic suspense series, Alternate Connection, (Countermeasure Series, Book 3) available for pre-order on all retailers. Foreign Service Specialist Rachael Moore's personal crusade puts her in the crosshairs of very dangerous people. She would risk everything to achieve her goal even if it means exposing her battered heart and deeply concealed dreams to a man who doesn't know the meaning of love. Writing had touched Chris Almeida’s and Cecilia Aubrey’s lives in different ways through the years, but never took flight until 2010, when Chris and Cecilia met and began roleplaying online as a hobby. It was through playing fictional characters in a sort of improv written theater that writing took a central position in their lives. The transition from roleplaying to novel writing was smooth, and they attribute the ease of writing realistic characters to their ability to live the scenes through role-play. Chris and Cecilia have since chosen to release all their titles independently. They have several short stories and two novels published under their own label, Éire Publishing, and are vocal supporters of independent publishing done right. They’re currently working on the next novel in their series. Through all the chaos and laughter, they still hold true to their roots, bringing their favorite role-play characters and stories to life. Leave a comment and enter the Rafflecopter drawing for a signed copy of any book in the series, reader’s choice. I love using technology to stay in contact with friends and family all over the US. Technology has provided me with many professional opportunities as well. It is fun to know that just about anywhere I travel now will put me in close proximity with a friend I have met online. Some days it is nice to unplug but other times it is great to be able to connect with people when you want a fun conversation or to talk to a friend when you are feeling down. And yes, when your spouse or significant other isn't with you in person, you can stay connected. Great story and great post! I like having my phone with me when I'm going somewhere in the car. I also like my iPad. I never thought that I would read ebooks on my phone. I still like having a printed book. I started using Facebook in November 2014. I've found that I like seeing what my friends and family are up to. Thank you for sharing about how you both started writing together.